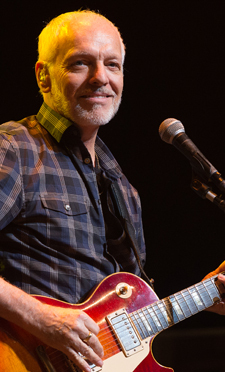 Peter Frampton remains one of the most celebrated artists and guitarists in rock history. At 16, he was lead singer and guitarist for British band the Herd. At 18, he co-founded one of the first super groups, seminal rock act Humble Pie. His session work includes collaborations with such legendary artists as George Harrison, Harry Nilsson, David Bowie, Jerry Lee Lewis, Ringo Starr, John Entwistle and many others. His fifth solo album, the electrifying 'Frampton Comes Alive! ', is celebrating its 40th anniversary this year and remains one of the top-selling live records of all time. Peter Frampton will resume his acclaimed 'Peter Frampton Raw: An Acoustic Tour' with more dates in 2017. Gordon Kennedy, Frampton's longtime collaborator and co-producer of his Grammy Award-winning album Fingerprints, will join him again for the March and April dates alongside Frampton's son, singer and guitarist Julian Frampton. "It has to be Mogami cable for me. I've used it for so many years. Whether it's getting my guitar into my amp or a microphone to my console, I know it can't sound any better than that."